Ever since she could remember, Mary Gomes has grown up living, breathing, and of course cooking food with a passion that few people can match. 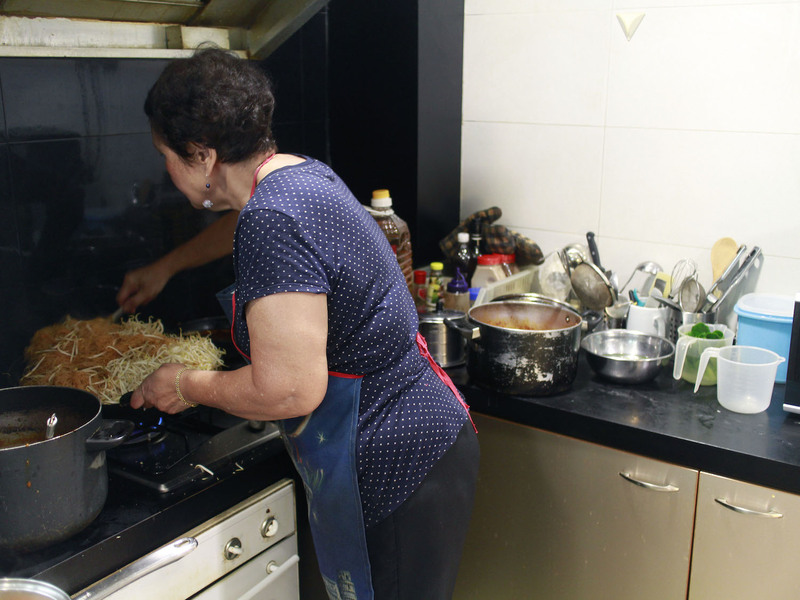 To her, the authenticity of her unique Eurasian cuisine is more than just comfort food, it’s also a way of life. 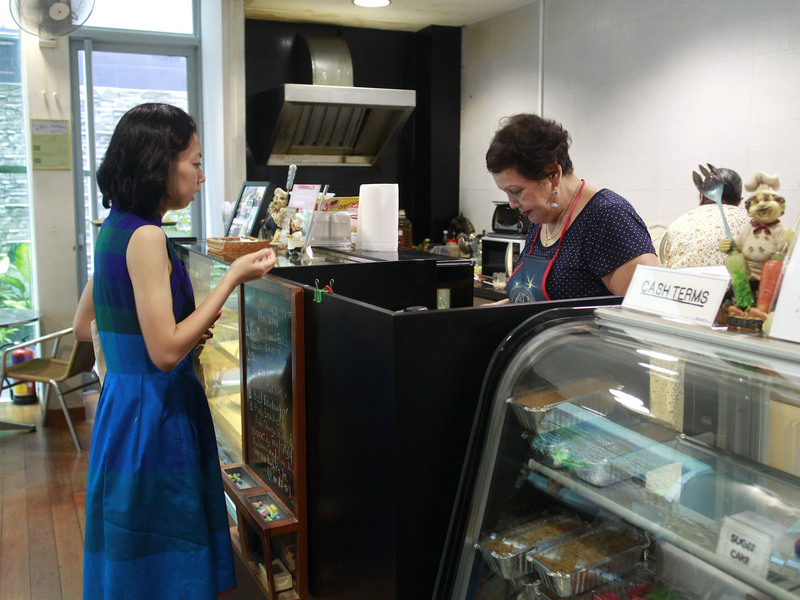 For the past seven years, she’s been the face, head chef, and unmistakable presence over at Mary’s Kafe (it’s spelt with a ‘k’ in line with the Eurasian spelling), a space that has grown to become the go-to place for comfort food for many of her loyal customers. Q: How did your love for cooking begin? When I was 6-years old, I used to accompany my mother to Tekka Market after mass at St Joseph’s Church to shop for ingredients to make an assortment of dishes. Onions, potatoes, candlenut, all sorts of things you might find in typical Eurasian cuisine. My sisters weren’t really interested, but somehow cooking came naturally to me. I would be in charge of grinding out the ingredients for the rempah (spice paste) by using the traditional batu giling (millstone). At that point I was so tiny I had to stand on a wooden crate just to grind the ingredients! From Mondays to Fridays, Mary whips up an assortment of different dishes steeped in Eurasian flavours. 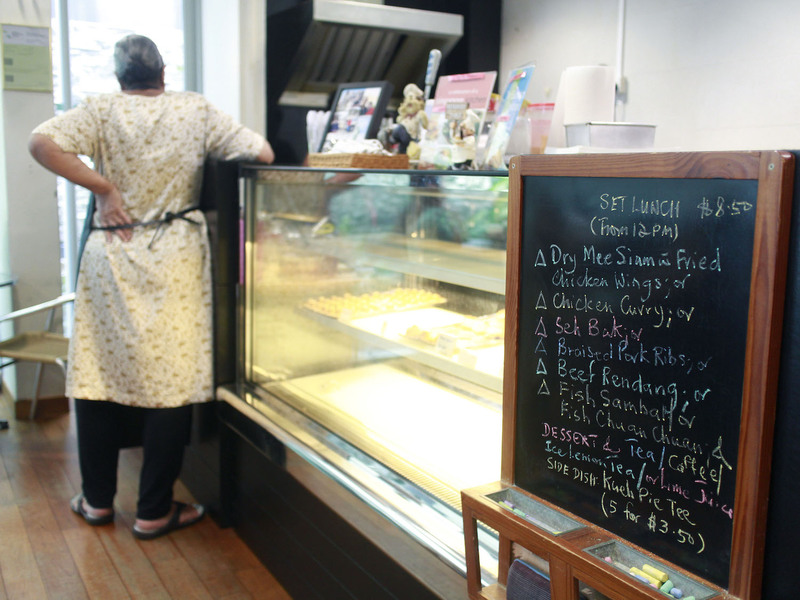 The menu at Mary’s Kafe rotates daily, together with a simple display of delectable pastries like Pang Suzie and Pineapple Tarts. Q: What other memories of food do you associate with your childhood? My mum would cook something every single day, we particularly loved her nonya kueh! Back then we didn’t have a refrigerator, but rather a wooden box with mesh that was suspended above the ground. It was always a treat rushing home to see who could grab whatever kueh mum placed in the fridge back then! 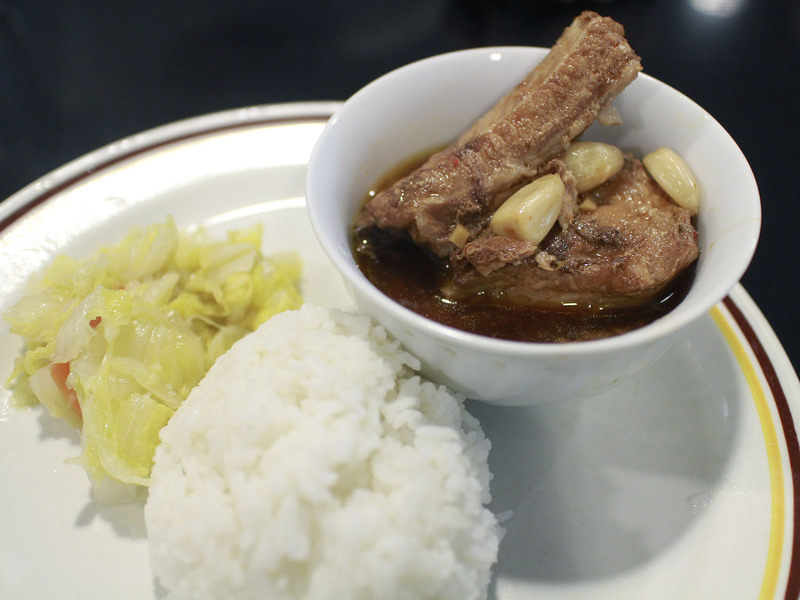 Rempah is an essential component to dishes like the Chicken Baksoh as seen here. Q: Tell us more about how you got about starting Mary’s Kafe? Well for over 28 years, I was working in Public Affairs Planing at DBS, where my main job was to go about scouring the island for the most suitable dishes for management meetings. The Chairman back then, Howe Yoon Chong, was a real foodie, so the stewardesses and I were always kept busy! I soon got transferred to another department later in my career and was litereally dragging myself to work, so I decided it was time for something different. Q: Were you still cooking during this period of time? The main kickstart for me came during my late 30s, when I started preparing weekly Sunday lunches for the parishoners at St Joseph’s Church. It was mostly my assortment of Chicken, Beef and Pork curries, which soon became a hit with the members of the church, so much so that my friends always said I should start my own restaurant! 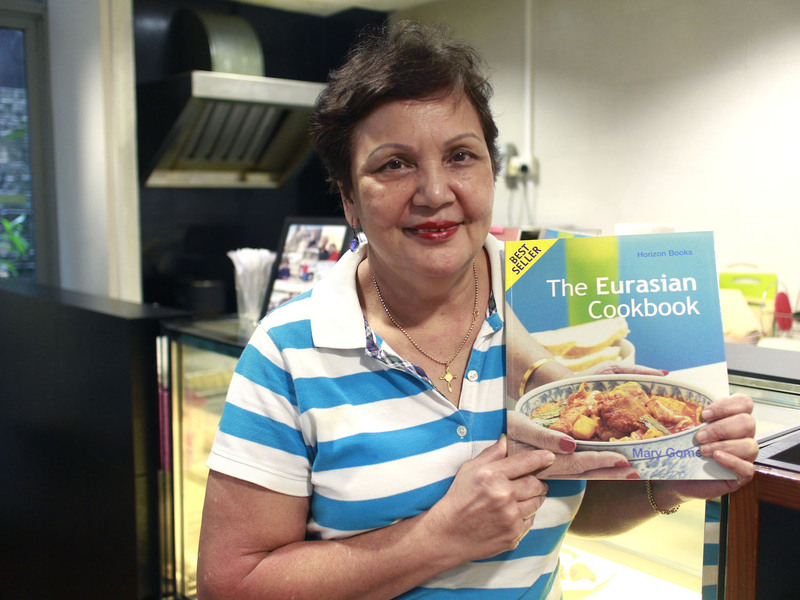 By this age I had mastered a ton of recipes, and was invited to create Singapore’s first-ever Eurasian cookbook, simply titled, My Eurasian Cookbook (2001). As of now, it has already gone through four print runs! 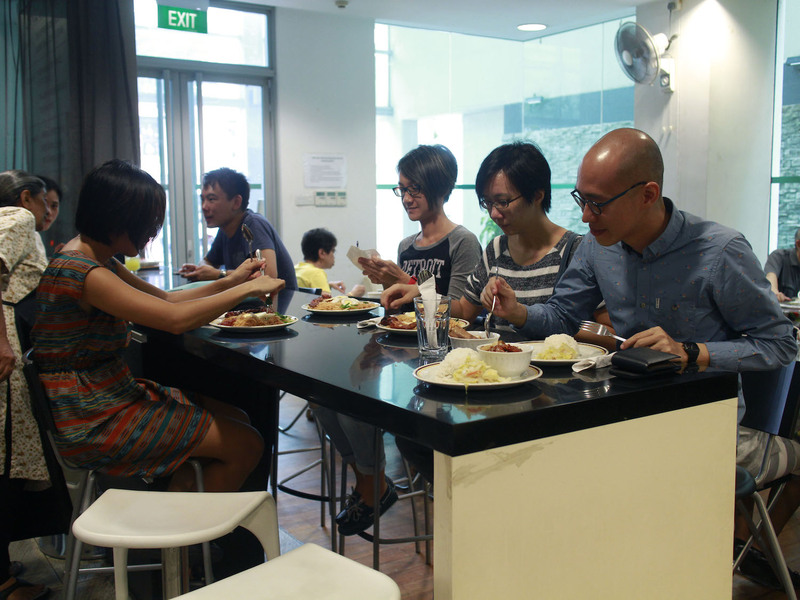 The best way to enjoy food at Mary’s Kafe is with a good bunch of friends or family. Q: So how did Mary’s Kafe begin? 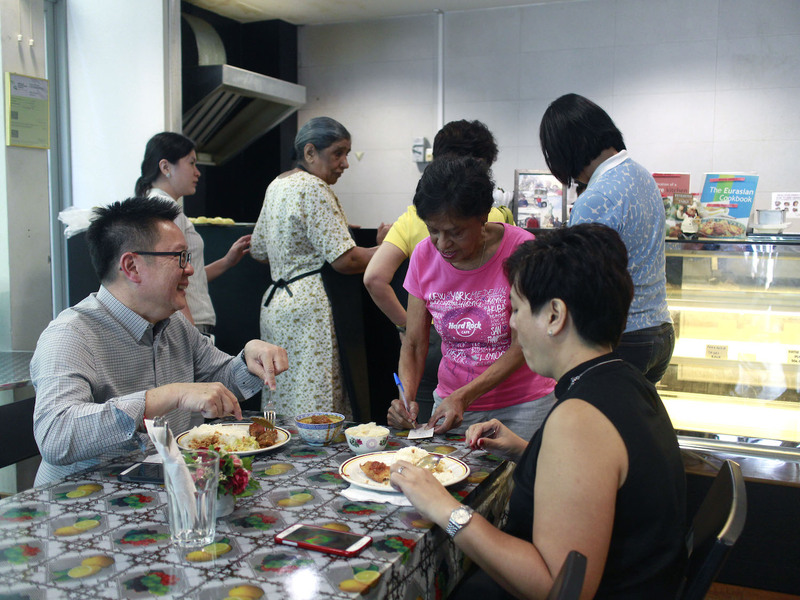 In 2008, I first opened Mary’s Kafe at the Singapore Council of Women’s Organisation (SCWO) at Waterloo Street. Business was brisk and we did dabble into catering as well. But then in 2010, the pastor from Kum Yan Methodist Church approached me to take over the current space, and I thought it was really good, so here we are! We turn five this September. Chatting with Mary at the counter is like an old friend who knows what you prefer. Q: So what’s Eurasian cooking all about? The essence of Eurasian cooking is all about rempah, which is the key to creating the curries that are main components of Eurasian cuisine. Instead of a blender, we use a meat grinder which ensures that the paste is more solid and has better flavour. Eurasian cuisine is also all about creating a balanced meal. Just think of Shepard’s Pie, you’ve got veggies, meat, mushrooms and potatoes all in a single meal! 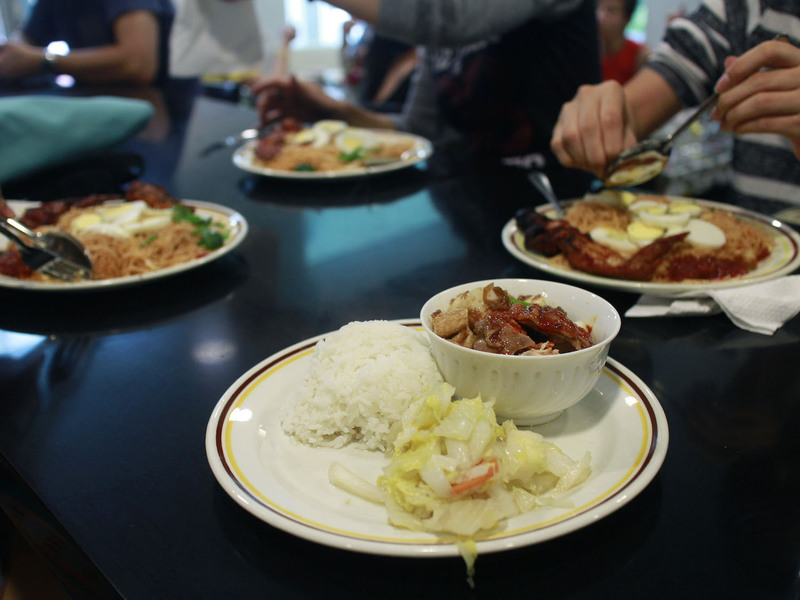 All our dishes from Pork Assam to Mee Siam also abide by the same principle. 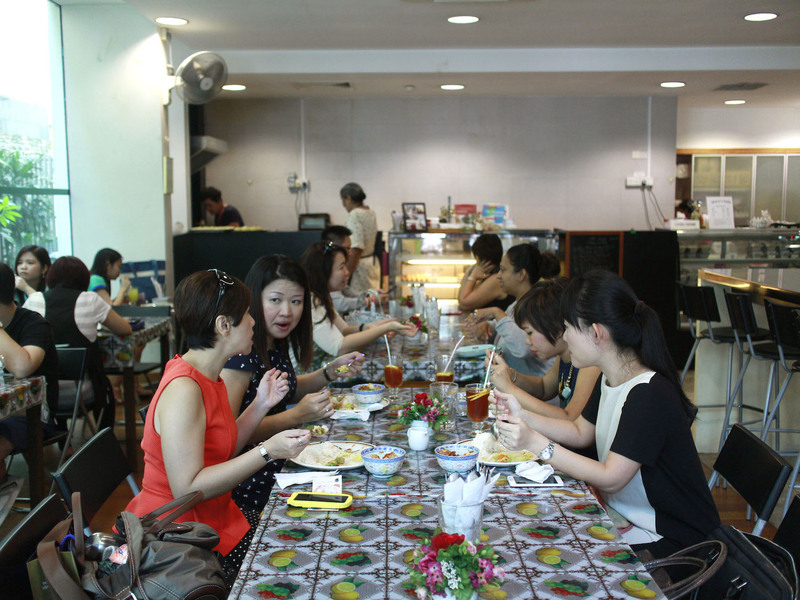 Chinese, Peranakan and Indian influences are also visible in Eurasian dishes. Sugee Cake for example originated in Goa, India, where they used semolina flour and cashews to create the cake. After travelling across various countries, it’s landed here where the cakes are made of semolina flour, almonds, butter and brandy! 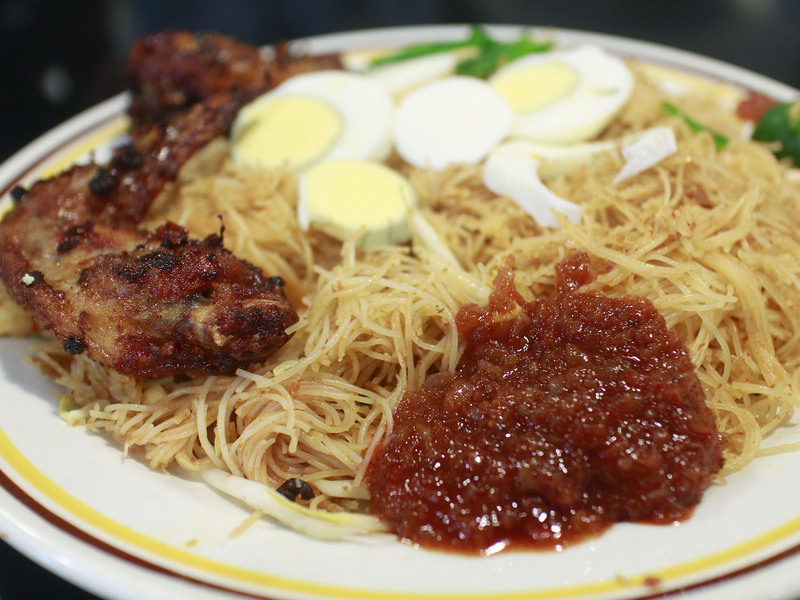 A hot favourite amongst the crowd is mee siam. Come too late and it’ll probably be completely sold out! Q: There seems to be lack of historical background and even understanding of Eurasians in Singapore. In your opinion, what does being Eurasian mean? In my opinion, Eurasians are always warm and hospitable. If you come to my place I’ll make sure you have a drink, and if it’s near dinner time, I’ll even see if I can set another plate for you! Having a history that spans across various countries (my mom was from Malacca), Eurasians families are a close-knit bunch. My family and I, all 11 of us, make it a point to meet up every Sunday to have dinner with our loved ones with what else but great Eurasian food! 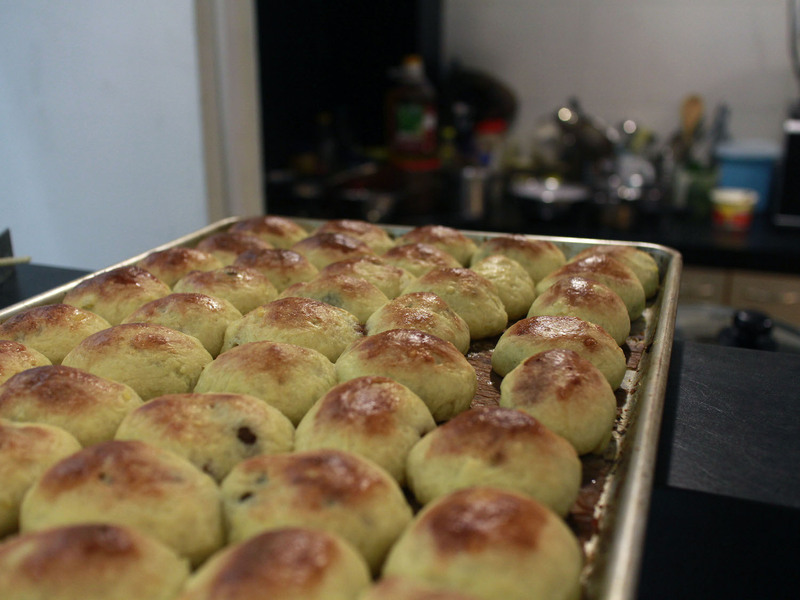 The Pang Suzie, a delicious pastry filled with chunks of flavourful minced meat. Q: How long do you think you’ll continue working at Mary’s Kafe? I must admit I’m getting a little tired, physically that is. I really enjoy having the customers here, plus working with my older sister, we’re very much all one big happy family. Thankfully my daughter is now slowly taking up the reigns, and she even has bright ideas to help expand our business. Mary’s older sister in the pink top will always be the one taking your drink and dessert orders with a smile. 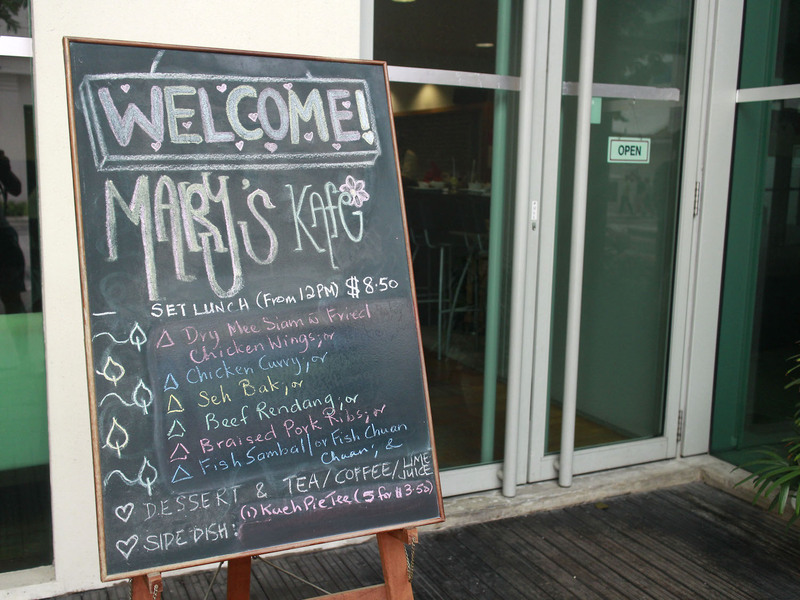 Decorated in a no-fuss homestyle design, Mary’s Kafe draws in the crowds at lunchtime on weekdays. What’s there to eat at Mary’s Kafe? The dishes at Mary’s Kafe are rotated on a daily basis. An assortment of curries/stews (Pork Assam, Beef Curry) make up the staples for the day, while specials like mee siam and Shepard’s Pie make guest appearances from time to time. Just to be sure you won’t miss Mary’s Kafe, just look out for the sign!